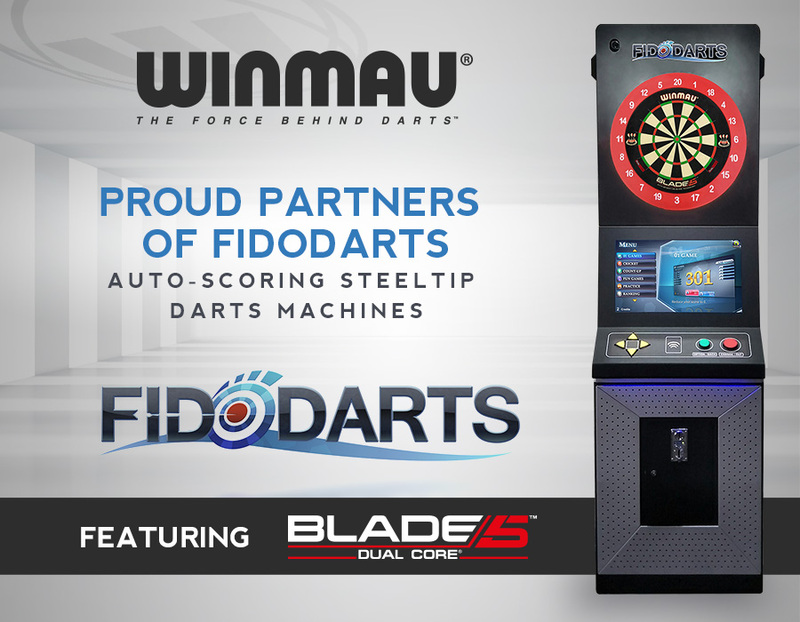 Winmau, the world’s leading darts brand, is pleased to announce their partnership with Taiwanese company, FidoDarts on their revolutionary, internet-enabled, self-scoring steeltip darts machine. Under the agreement, Winmau will supply FidoDarts with its class-leading Blade 5 Dual Core dartboards for use in the machines as well as distribute the product in the UK. In return, FidoDarts has been appointed as the official distributor of all Winmau products across Taiwan and China. Automatic darts machines have been a feature in pubs and clubs for several years. However, players have mainly had to use softip darts and play on a synthetic dartboard. The new FidoDarts machine combines all the features of automatic scoring and suggested finishes with the ability to play on a traditional bristle board using steeltip darts. In addition to the standard 173cm bullseye height set up, a 137cm version (as introduced by Winmau’s partner the World Disability Darts Association) to accommodate players in a wheelchair is also available. The coin-operated machines use a series of miniature cameras to track the trajectory of each dart and identify scores. Players can choose whether to play games of 501 or 301, as well as cricket and count up. In addition, the FidoDarts machine offers training exercises designed to improve accuracy and consistency. Each machine is internet-enabled, allowing players to take on opponents in other locations, opening up the potential for global matches. A free smartphone app interacts with the machine and enables players to track their own score history and performance against a global leader board.